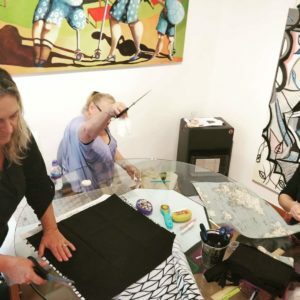 No Time to Sew has been created from my love of sewing and willingness to share it with people around me. 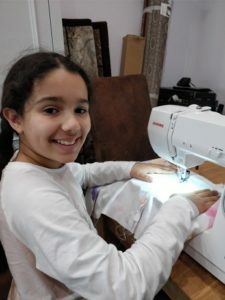 I would love for you to share your sewing projects with all of us and this thread is dedicated to you and your creations. 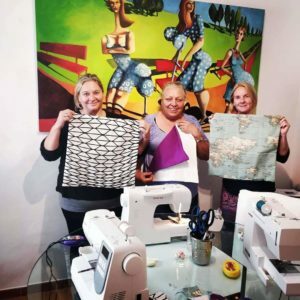 Send us your makes with all the details, about pattern you used, materials you re-cycled, techniques you learned and we will share it here. Let's be proud of our creations and spread the creative bug to our local community. their makers and inspire all to give it a go themselves. Please go to our Share Your Makes page to send us photos and details about your recent makes. Here you will also find pictures from our workshops with most recent ones first. Enjoy! 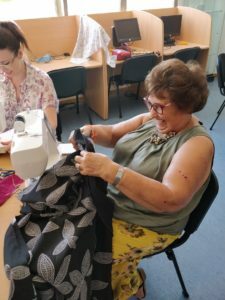 July was full of creativity in our sewing workshops. 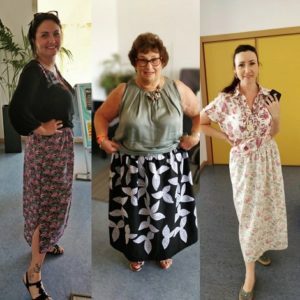 We've teamed up with lovely Melissa from Costa Women West of Marbella to create a dedicated 4 hours workshop, where we made three unique, perfectly fitted skirts. As this was a beginner class we opted for a elastic waist so we could be sure it will still fit after all those summer barbecues. Having a simpler design meant we could concentrate on the finish and even made a few special adjustments, like adding a side slit to Emma's skirt. 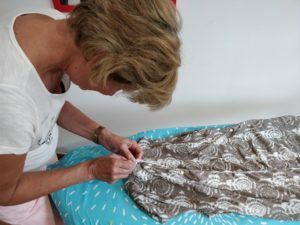 All three skirts were finished on the overlocker, which the ladies tackled with no fear and having had only 3 seconds practice session 🙂 I loved this class so much, I will add it as a permanent feature to our workshop offering. Emma, a keen knitter has never used a machine before, but you wouldn't even know that, she was pro in minutes! 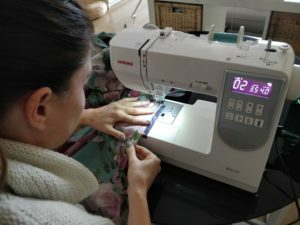 Melissa brought her own machine, and it took us couple of minutes to get it going, but after re-threading it and some encouraging words, she was set to go. 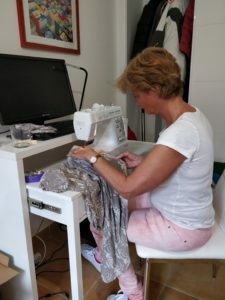 Jenny used to sew in the past, and has even gifted a sewing machine to her grand-daughters, all her skills had came back as soon as she sat in front of the machine. We didn't rush, made sure we had frequent coffee and cake brakes and in the end created 3 gorgeous skirts. I particularly love Jenny's black with white embroidery skirt, actually I liked the fabric so much I got some for me to make one too. 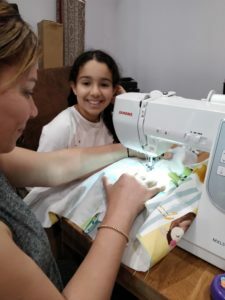 In July, one of our students who attended the Cancelada class, Hannah, has taken the plunge and bought herself a brand new sewing machine (after carefully sending us all the ones she considered, so we could advice her on the one that will see her through in many years of sewing). She wanted a quick couple of hours refresher class at her home, to make sure she knows how to use her new "baby" and get the most of all the features the machine has. 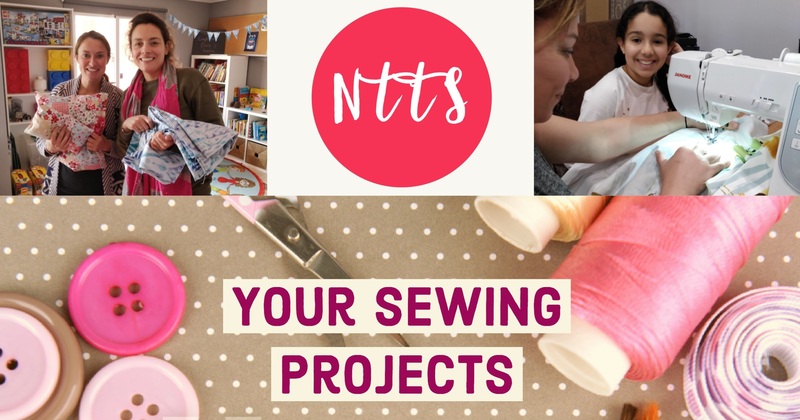 Check out all our sewing workshops and get inspired to discover sewing! June has been a month of vacations but also great creativity amongst our students. We had a new student Lelanie who decided to make a summer dress. This was is our longest workshop, and we ended up doing it over three days, with couple of hours each day. Every day I left Lelanie with some homework, so she practised the skills we learnt in class on moving her project a little bit further. How to work with the pattern? 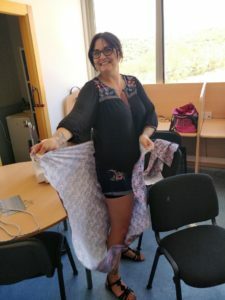 Our summer dress class teaches some invaluable techniques like working with a pattern, making your own biased binding (used for finishing armholes and necklines) and Lelanie steamed through all difficulties. 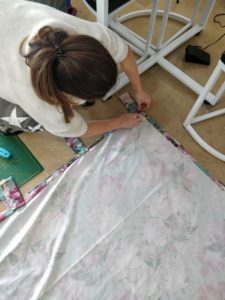 She has been sewing in the past, many years ago and wanted to rediscover her skills and confidence in making garments. I don't need to tell you she completely nailed it and has already planned to make another one! 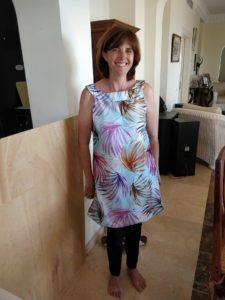 If you would like to make your own summer dress check out our Intermediate Sewing Class - Summer Cotton Dress. Our first class in the new location, further up the coast towards Malaga couldn't have gone any better! Hannah, Nicky & Judy had a great Sunday morning making zip cushion covers and learning new skills and techniques. 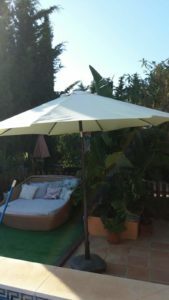 The class took place in a lovely village of Cancelada, near San Pedro de Alcantara & Estepona. 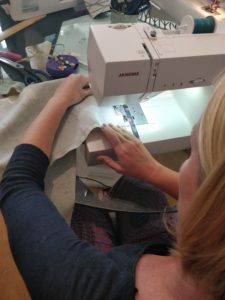 Creative Hannah had never used a machine before and came to the workshop to see if she will catch the sewing bug and like using one. Within 5 minutes she loved it, and is now planning to buy one! 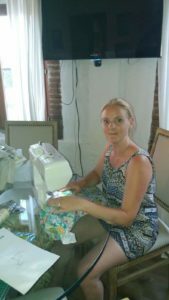 She has done some hand sewing in the past, and loved the easiness of use in the modern computerised models we use in class. Nicky and Judy had both sewn before, but as NIcky explained she was a very frustrated sewer, haven't had classes before and used internet to learn new techniques. It was great to hear them say "oh that's how you do it!" when we practised different skills in class. Gone are the bad habits and struggles with putting the zipper in. 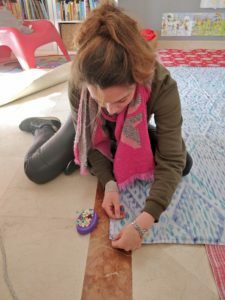 A keen quilter Nicky also got a chance to try different sewing accessories like cutting mat, rotary cutter, sewing ruler that will make her quilting so much easier. 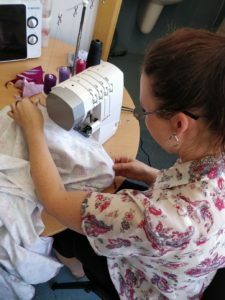 If you would like to brush up on your sewing skills, or try it out for the first time, join one of our beginner or intermediate one day courses . had a very special project in mind. She wanted to re-create one of her favourite dresses from the past. 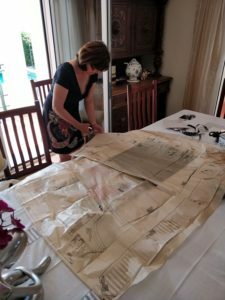 Her friend has traced the pieces in tracing paper and Isabelle has bought her dream fabric. It was quite stretchy, so we needed to take it in a lot to make it fit her petite figure. In 3 hours we managed to fit and assemble it while learning all about the machine. The only thing remaining is to finish the neckline, armholes and hem, which we will do in the next class. If you have a special project in mind and need a hand, let us know! buttonholes using a narrow zig zag stitched, and it looked so professional, see for yourself! 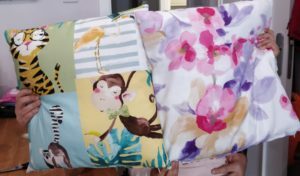 Sasha has made a brand new covers for a tiny pillow and blanket for her daughter in this lovely flowery fabric. Do you have a project you would like help with? >>> Private Class Info. 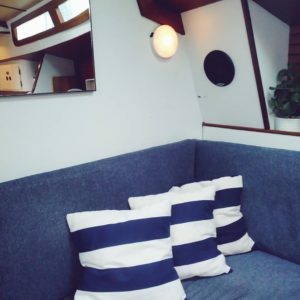 Vibeke has made a set of perfectly matched striped cushions that add so much marine feel to her home boat! If you would like to create one yourself, check out our cushion class > Cushion Class Info. 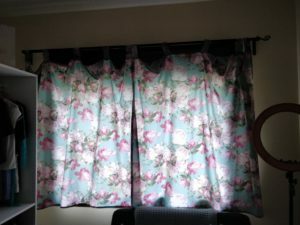 Madeline created her first set of custom made curtains for her walk in wardrobe room. We picked the fabric in our local fabric store and it fitted perfectly with the pastel colours accents throughout her room. A lot of careful measuring and painful pinning, but it was all worth it. 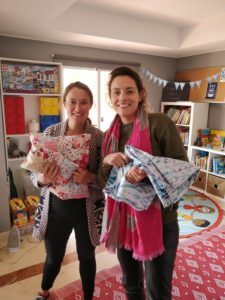 Maya & Rita have created their first ever project, and how great it looks in these vibrant fabrics! Are you thinking of doing a class with your son or daughter? Not a problem, we welcome kids from the age of 8 to join the class with you.